As the tournament season has been in full swing, the Gym Leaders have been very busy over the last 2 months with events. However, we have managed to work in quite a few challenges during the same time. Several trainers have given the Gym Leaders some great battles, just falling short of earning a badge. Meanwhile a couple of trainers have inked their names onto our “Wall of Fame”, earning their first badges. As most of you have learned, the Gym Leaders do not “go easy” on any challengers. Our aim is to help you improve your decks and your playing skills. Our leaders are not unbeatable, but to walk away with a gym badge is an accomplishment that you should definitely be proud of. Here is how the leaders currently stand. To date, the Fincastle Gym Leaders have completed 169 challenges. 22 badges have been earned, giving the Gym Leaders an overall record of 147 wins and 22 losses (an 86.9 win percentage). There are still 2 undefeated types, Water and Darkness, while the Fighting-type has only 1 loss. The Psychic-type, Lightning-type and Grass-type leaders are the most challenged to date (33 Psychic, 29 Lightning and 29 Grass). In terms of defeats, Psychic leads the way with 6 badges won, followed by 5 Grass badges and 4 Lightning. The percentages stay fairly even across the board. Obviously, the most challenged types yield the most defeats. Here’s a little more detail by Gym Leader. Gym Leader Joel defends the Grass, Fighting, Steel and sometimes Fire-type badges. As the Grass-type leader, Joel is 24-5 (82.8%). The advent of Black & White an introduction of Reshiram has definitely increased the degree of difficulty on the Gym Leader. However, as those who have tried for the badge know, he has many tricks up his sleeve. As the Steel-type leader, Joel is 9-3 (75%). Limited options from Pokemon make Steel decks hard to come up with, but he tries to keep things interesting with the Steel guys. As the Fighting-type leader, Joel is 18-1 (94.7%). As his favorite type, the Gym Leader is always working on new ideas and creates some very hard-hitting decks. Despite Fire-types being the nemesis to most of his other types, Gym Leader Joel has also filled in as the Fire-type leader. In that role, he is 5-1 (83.3%). Overall, Gym Leader Joel holds a record of 56-10 (84.8%). Gym Leader Marthe holds down the duties of defending 2 of the more interesting types, Lightning and Psychic. Since the Gym’s birth, these 2 types have swung wildly from strong types to weak and back as card sets have been added and cut. Lightning, once hardly playable, has become almost a guarantee to be at the top tables in major tournaments. Psychic, which was dominant when we began playing, remains a good source for “rogue” decks, but not as strong as it was. As the Lightning-type leader, Marthe is 21-4 (84%). As the Psychic-type leader, Marthe is 27-6 (81.8%). Overall, Gym Leader Marthe is 48-10 (82.8%). As leader of 2 of the most challenged types, one gets the impression that many trainers think she may be the easiest leader to take on. However, as the other Gym Leaders know from playing her at home and as many have found out the hard way, Gym Leader Marthe will always test your abilities and a badge won against her is truly “earned”. Gym Leader Logan is our youngest leader. He is the reason that there is a Fincastle Pokemon Gym. Logan has traveled across the country and has battled with and defeated some the best players in the world. That being said, it should be no surprise that he holds the only 2 undefeated types at the Gym. As the Water-type leader, Logan is 16-0 (100%). As the Darkness-type leader he is 13-0 (100%). Gym Leader Logan has also stepped in a few times to take challenges for the Fire badge before we had a leader. In those defenses, Logan is 2-1 (66.7%). Overall, Logan holds a record of 31-1 (96.9%). Our only true Fire-type leader, Austin, won the title as a result of a tournament within the Gym. Austin battled through to a showdown with Logan that he won to earn the title. As Gym Leader, Austin is 13-1 (92.9%). As of now, Austin has retired with that record and as the Fire-type leader. He represented the Gym well in badge defenses and at premier tournaments. Once a Gym Leader, always a Gym Leader, so says the Gym. Should he return from time to time, trainers should battle him if they have the chance and learn from those battles. With the Fire Gym Leader position open a new type (Dragon) on its way, who knows what may come over the next year. 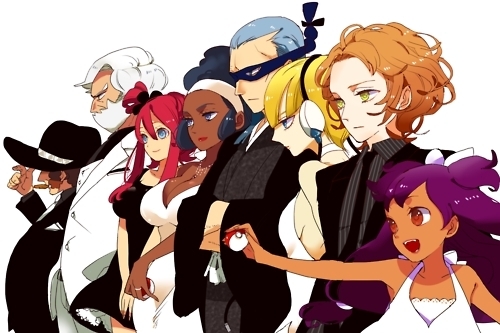 Whether our existing leaders pick up those positions or new Gym Leaders will join our ranks will be discussed and determined before the summer is over. A Dragon-type leader will definitely be added to the types available to challenge when that set is released (most likely in the Fall). We will have to wait and see. The Fincastle Gym awarded a binder and full collection of promo cards to the trainer that attempted the 100th challenge. As we near #200, all we can say is that we will have to double the reward for whoever attempts the 200th challenge. We will keep everyone posted as we get closer, but as before we will keep a lid on the numbers as we get close. The Gym encourages everyone to keep earning those challenges and as soon as you get one, go for it. If you are defeated, learn from it and try again. Keep battling and see you at the Gym! This entry was posted in Gym Leader Challenges and tagged gaming, steel decks, training. Bookmark the permalink.